Last week we shared a guest post from Wag Lifetime Joint Care about what age you should start your dog on a joint supplement. Before our golden retriever Sheba got diagnosed with arthritis just over a year ago, I never thought much about joint supplements, or any type of supplements for my dogs. I’ve never been convinced of the need for them, for my pets or myself. That’s all changed now. 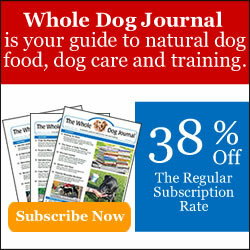 We had tried two different supplements with Sheba before deciding to try Wag. With the first we didn’t see any real results, and we have been happy enough with the second. But it was a powder we added to her food, and she started to be fussy about eating her food with the powder on it. We didn’t like the pill version of that supplement. So when we got an opportunity to try Wag, it seemed like a good idea to try a change. Just because one works good doesn’t mean another won’t work equally as well or even better. I don’t like to have all of our eggs in one basket; so to speak, I think it’s good to have more than one option. It protects not just joints, but bones, ligaments, and tendons. It is effective for dogs of all ages, breeds, and sizes. It is fast acting (works in 7-10 days), clinically proven, and safe. The ingredients are all natural, high quality, not generic. These ingredients consist of Natural Eggshell Membrane (which won an award for new product innovation and is 5 times more effective than glucosamine), 2 all natural botanical extracts, and chelated minerals. There is no glucosamine in Wag. Pet Research, the company that manufactures Wag, is a young company made up of actual dog owners who consider their dogs family and even take them to work with them. There is a 30 day full money back guarantee. That’s all great but the bottom line here is: Does Sheba like it, and how is it working for her? Wag comes in tablet form and the dosage is 2 tablets daily for dogs 41-134 lbs. Sheba weighs 67-69 lbs so we decided to start her on two tablets for one week, and then reduce her to 1 since she’s on the lower end of the weight scale. She loves the tablets and will take one whole, but most of the time my hubby just breaks it into pieces and adds it to her supper. They break very easily. It wasn’t long after we started her on it that we went outside and I saw something I hadn’t seen in a very long time: Sheba running across the yard for no apparent reason….she wasn’t chasing a ball, she wasn’t chasing her siblings, she was just running for the sheer joy of it! Now I have to point out that this was after a spell of bad weather and yard conditions when we hadn’t been getting outside as much, but still. I remember it so clearly because it was at the time Luke was in his recovery period for his knee, and of course he started running after her, and I felt so bad having to stop them! However, a couple of weeks ago my hubby and I had both noticed that Sheba was having some difficulty getting up from a lying down position, especially in the mornings. I also thought she had been licking her paws more, which can be a sign of pain. We discussed it and decided to up her dose of Wag to 1 ½ tablets per day to see if that helped. This was also at a time we weren’t getting outside a lot again, and one thing that can help arthritis is to keep moving. Since we upped her dosage, and she has been a bit more active, she is no longer having difficulty getting up! I think it’s a combination of the two factors. We are all pleased with Wag, and we will be keeping Sheba on it. It was just after starting Sheba on the Wag that Luke was diagnosed with his luxating patella. Since we had plenty of Sheba’s old supplement left, we decided to try him on that. We thought it was helping a lot at first, but now we’re not quite as sure and we are either going to switch him to Wag, or we have another product we may try as well. Cricket is also on joint supplements, as a preventative measure. She has no joint issues, but she is 10 years old and very active, and we realize now we should have had her on some all along. Of course it’s a personal decision for us to do this, and you should always check with your own vet if your dog is showing any signs of joint issues themselves (such as limping or difficulty rising). If you would like to learn more about Wag, you can visit their website or follow them on Facebook and Twitter. They gave me a discount code to share, WAG10 will get you 10% off your first order, and we are also giving away one bottle! Just fill out the Rafflecopter below for your chances to win. The giveaway will be open for one week, USA -& Canadian- residents 18 years of age and older only, void where prohibited by law. Disclaimer: We were given one bottle of Wag to try at no charge, but were in no other way compensated for this post. Wag ‘n Woof Pets only shares products that we feel will be of interest or benefit to our readers, and all reviews are our own honest opinions. Over the last several years, I’ve used joint supplements to help some of my older dogs with arthritis and mobility issues. I think it’s such a great idea, and it pays to have more than one option as well. I’ve never used supplements on any of my pets but I have often wondered if it would make a difference! We have really seen that it does! Sheba was prescribed Rimadyl, a painkiller with side effects, and we’ve only had to give it to her 2 or 3 times in over a year. I have 4 large, older, rescued dogs. Mobility and pain is an issue with all 4. Supplements for all my pets are so expensive especially if the dogs show no signs of improvement. I have tried a few brands without much luck. Maybe Wag is the one. I think sometimes you have to try more than one before you hit on the right one. Good luck in the giveaway, I’d love for you to be able to give Wag a try and see if it’s the one! No supplements to puppies diet-feeding quality food but plan on looking into what is best for him. I know some people do, but I don’t think I would start them puppies one until they were full grown, or at least a year old, unless there was a good reason to (like Luke’s luxating patella diagnosis). Their food has joint supplements in it, and I just started giving Dasuquin as a preventative. That’s great! We didn’t have much luck with Dasaquin, but I think that every supplement can work differently for every pet. Our cat was on the cat version of that, Cosequin, and it worked great for her. They really do help, don’t they? It’s tough when they get old and don’t get around as well, so anything that can help is great. My guys are still young but I would give this to my sister for her senior dogs. Sorry if you had trouble commenting, Susan, but glad they came through OK! I don’t use them yet because my guys are very young but I would give these to my sister who has 4 senior dogs. Good luck in the giveaway, it sounds like your sister could really use them, with 4 seniors! I do not but am going to start. Great review and I’m so glad you seen some great results with SHeba. Thank you. I think you’ll find it’s a great thing to add to your dogs’ health routines. Good luck if you entered the giveaway! I have used joint supplements as well. Loved this post Jan.
I’m glad you found a good supplement ! Thank you, Jenna! I hope you entered the giveaway for a chance to try these as well. We’re glad to see this seems to be working for Sheba. Thank you!! We have used supplements with our cat Samantha as well, so they do make them for cats too, though I haven’t seen as many different options for them. It’s probably coming though. I use it for both. I have nine dogs, including three rescues. I have used joint supplements for both joint issues and as preventative. For a dog who is heavier and/or predisposed to having joint issues, Or older, I have used it as a preventative….and I have had a couple others with joint issues,mostly due to age and I’ve used joint supplements for them. I think preventative joint supplements have their place and are useful for certain dogs. Enjoyed seeing the pics of how happy yoir baby looks romping around in the yard and would like to try this supplement for one of my older shelties who is starting to have similar age related troubles such as some trouble getting up and also some trouble with stairs and see how it does for for my baby. Thank you for the Chsnce to win. Nine dogs, three rescues, wow, that is wonderful! That’s a lot to take on and I admire anyone who can do it. It sounds like you are taking very good care of all of them in addressing the issues they have. Good luck in the giveaway!! I have had Bentley on a joint supplement for about 8 months. I could hear a few pops and cracks when he climbed on the couch. This has stopped completely since we started his soft chews. We’ve loved two big dogs with hip dysplatia and I’ll do anything to spare Bentley joint pain. That is great to hear that supplements are working for Bentley as well. We do want to do everything we can to keep them from having any kind of joint problems. Hip displatia is a tough one especially, isn’t it? I enjoyed this post. Although Harley isn’t showing any signs of having joint problems – however, he will be 7 years old in November and I am looking into supplements now so I can be prepared. Thanks so much for writing this. Hopefully this helped to give you some ideas for Harley. I think now is a great time to start with him. 7 is considered the start of the senior years, I think, or maybe it’s 8? I haven’t yet but I’m thinking about it. Hopefully you entered the giveaway, it would be a great way to get started! It is always great when you find a supplement that you like. We have Thunder and Storm on a supplement and it has worked very well for them. I’m so glad you’ve been having good luck with them as well! I get treats for hip + joint health every now and then and sometimes there is glucosamine included in my kibble, but we don’t have a regular supplement routine at the moment. Zoomies are the best!! I’m sure the special treats and ingredients in kibble can be a great help too. For a while that’s all we did with Cricket too, but after all the issues we’ve had we thought maybe we’d better step things up for her as well. Glad you found a good option for Sheba. I loved seeing her leaping in the snow. Thanks. It makes my heart happy every time I see her having fun, and I hope that continues for a long time. We do try to be careful not to let her jump TOO much though. We know Wag works great for many dogs. For some reason it did nothing for Katie, but different dogs and breeds respond differently to things. There are medications that usually help dogs and they don’t do a thing for Katie. One has to find what works best for each individual dog, there is no one blanket solution. That is so true, Emma, and is exactly why I want to try different products to try to find the best for each dog. I hope you’ve found something else that helps Katie? I may order this for my Benji…he’s turning 10 in and is starting to show signs of possible arthritis. I just entered the giveaway too. Thanks for the great info! Good luck in the giveaway, Sheryl! I think it would be a great idea to start Benji on something before he gets any worse. It’s great to see Sheba! It seems you really found a good treatment. I will read more at their site, that sounds very good. Many thanks for sharing your experiences. And thank you for coming by to read them! We are very pleased we’ve found something that seems to be helping her a lot.